A major objective of the International Year of Crystallography is to establish a vibrant worldwide network of schools participating in crystal-growing experiments and taking part in national and regional competitions. This will introduce students to the exciting, challenging and sometimes frustrating world of growing crystals. We announce a worldwide competition, open to all schoolchildren. The winners will be those who most successfully convey their experiences to the panel of judges through videos or essays. Certificates and prizes will be sent by mail to the laureates (laureates will be notified in advance about the exact date). Each contribution should clearly show or mention the experimental work carried out by the participants during growing their single crystals (compounds and methods used are free of choice). Furthermore the contribution should reflect in a creative way on the experimental work and theoretical background and/or applications. The closing date for submissions was 22 November 2014. A maximum of one entry could be submitted by any individual or team (essay or video). Contributions were required to respect the category guidelines (see above) and be submitted in digital form only. The winning contributions will receive a certificate and a medal. A panel of judges will evaluate the entries in two different categories. The following criteria will be used: creativity, aesthetic value, description of working plan and experimental work, clarity of explanations and scientific background. On this web site we provide information to teachers and to schools or other organizations who want to join in this exciting venture. For newcomers, the easiest way will be to contact the organizers of established national competitions. 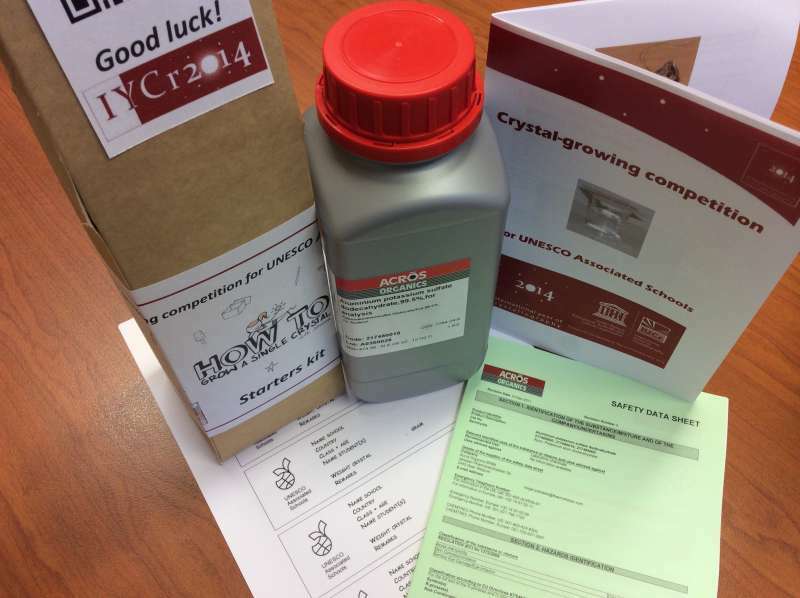 We provide tips on how to run such a competition that include information on getting started with basic crystal-growing experiments. The International Union of Crystallography has organized, together with UNESCO, a special crystal growing competition for selected schools belonging to the UNESCO Associated Schools Network. Selected schools have received a starters kit containing some documentation and 1 kg alum, the material to crystallize during this competition. A brochure provides information to teachers and schools who participate in this exciting venture. The official start of the competition was Monday 6 October 2014. During a period of four weeks students should grow a single crystal of alum. We recommend to work in groups of 4-6 students which makes the daily follow-up of the crystallization process easier. The competition ends on Friday 31 October 2014. A total of 51 crystals have been submitted to UNESCO headquarters from participants in Singapore, Benin, Argentina, Cote d'Ivoire, France, Zambia, Cape Verde and Switzerland. In parallel with these activities for schoolchildren, the IUCr Commission on Crystal Growth and Characterization of Materials, in association with the International Organization of Crystal Growth, is building on this web site a gallery of pictures of artificially grown crystals. These pictures may be freely used for educational purposes, and demonstrate the wide range of procedures used to grow many types of crystal for research and industrial use.